Every song is fresh. Every scene is new. Every night is different. It's all improvised and it's all funny! The hilarious "Broadway's Next Hit Musical" is the only unscripted theatrical awards show and stage musical. The cast is a team of talented and experienced improv comedians and musicians from New York City. The first half of the show is a parody of a typical awards show. The cast takes fictional "hit song" suggestions from the audience. They improvise the lyrics and create an entirely spontaneous evening of music and laughs, competing against each other to create the audience's favorite song of the evening. 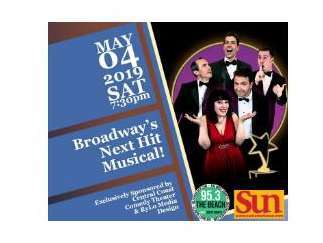 The audience votes for a winner, and in the second half of the show, the cast turns the winner's song into a full-blown improvised musical, complete with memorable characters, witty dialogue, and plot twists galore. What fake "Hit Song" title will you suggest? (Can't be an actual song title.) The humor is family friendly.